he words “Space Force” conjure up images of plastoid-alloy-clad soldiers firing ray guns at aliens, but military activities in space aren’t just science fiction. The U.S. military has been involved with space since the beginning, just, perhaps, not under that name. Yet if the idea is to ensure the military is involved in space, a dedicated space force may not be needed; the military has been in space since space was a place you could be in. As early as 1915, the newly established National Advisory Committee for Aeronautics (NACA) was dominated by military personnel and industry executives. NACA laboratories helped develop many technologies that ended up in military aircraft during World War II. After that, NACA worked with the Air Force to develop planes capable of supersonic flight. It then moved on to working on ballistic missile designs and in the 1950s began developing plans for manned flight. In 1958, a year after the U.S.S.R’s launch of the first ballistic missile and Sputnik satellite kickstarted the Space Race, NACA was rolled into the newly created NASA, a civilian agency which had a broader mandate, more power and more resources. Clinton Parks at Space.com reports that the civilian nature of NASA was never a given. Senate Majority Leader Lyndon Johnson wanted to establish a space agency to make sure the United States controlled space militarily. President Eisenhower didn’t want a space agency at all, believing it was a waste of money. Eventually, the two compromised, creating a civilian agency after Johnson was convinced space wasn’t just a potential battlefield, but that a platform for scientific and technological advancement that would be a huge boon for the U.S. and commercial interests. The establishment of NASA did not mean an end for the U.S. military in space, though many of its projects among the stars were and still are classified. In fact, during the 1960s, the U.S. Air Force ran a parallel manned space program to the one run by NASA, even designing an orbiting “laboratory” and selecting a class of 17 astronauts. Though it ran for six years, the program was cancelled in 1969 and no Air Force astronauts were launched (that we know of). In 1982, the Air Force Space Command was officially established, and today employs 35,000 people. The agency works on cybersecurity, launches satellites and other payloads for the military and other government agencies, monitors ballistic missile launches and orbiting satellites and runs a military GPS system. And of course there’s plenty of things they do that we don’t know about. 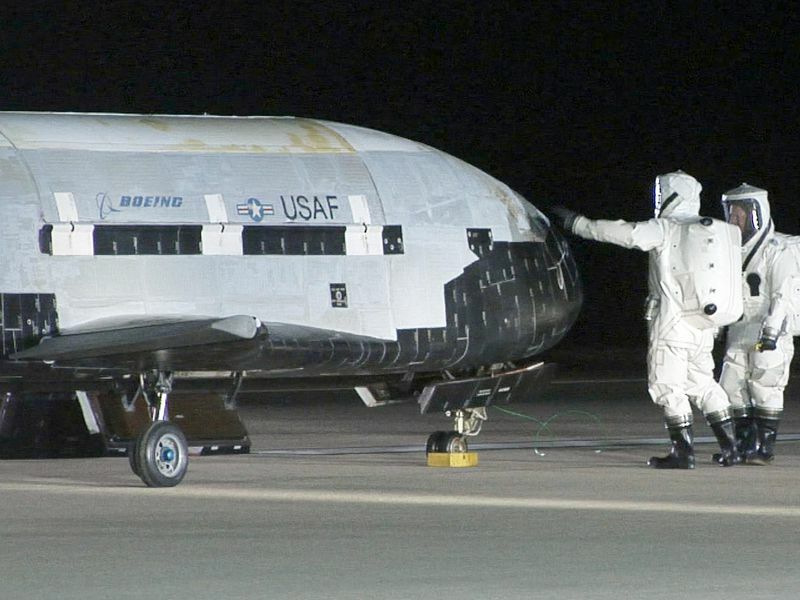 For instance, it’s well documented that the Air Force has two X-37B space planes, including one that returned to Earth last year after two years in orbit, though what it was doing is unknown. And NASA and the military also maintain a strong relationship. Over the decades, the vast majority of NASA astronauts have been military service members. During the heyday of the space shuttle, NASA would routinely ferry classified payloads into orbit for the Department of Defense among other projects the agencies have collaborated on. What’s more, the military seems resistant to the idea of separating out a Space Force from the Air Force. Secretary of Defense Jim Mattis, for one, has gone on the record opposing the creation of a space force. Last summer, when a Space Corps proposal was floated in Congress, Mattis wrote in a letter that it would add an “additional organizational and administrative tail” and excess layers of bureaucracy to military operations. At the that time, the White House also called the establishment of a space branch “premature.” Officials from the Air Force also went on record saying the move would add costs and unnecessary layers of bureaucracy to current space operations and that they would rather space operations become more integrated into the Air Force’s mission.